Happy new year and welcome to 2009. 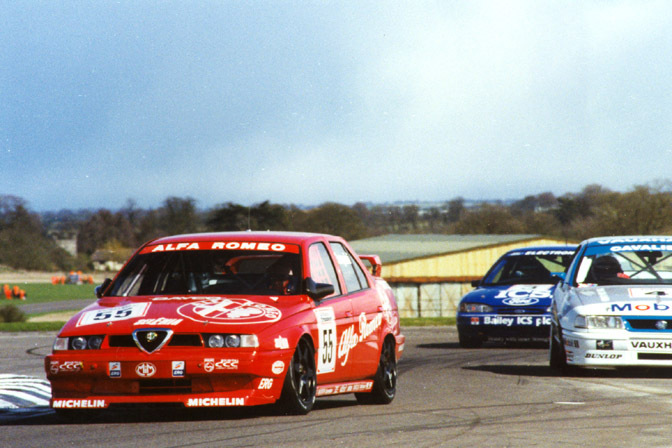 What better way that to look back to the 1990’s with the help of BTCC.net and Peter Still Photographic archives. 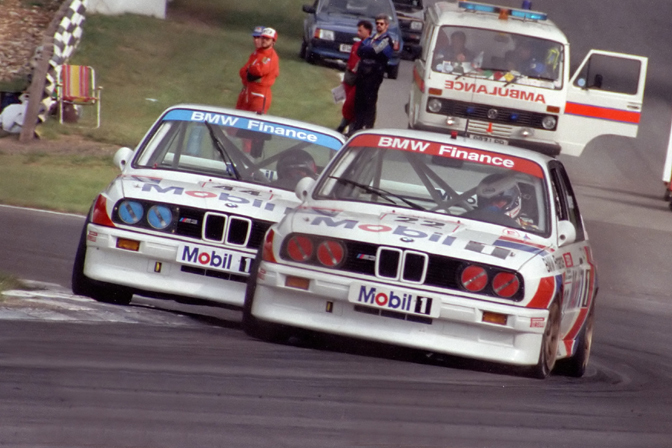 Many Touring Car fans would classify the ‘Super-Turing’ era as the golden era of Touring Car Championships, although the competition in recent years runs this era close. The man in the street believed his Ford Mondeo ‘rep’ car was the same, as one Nigel Mansell would drive in 1998. They were worlds apart, but customers and manufactures loved it. 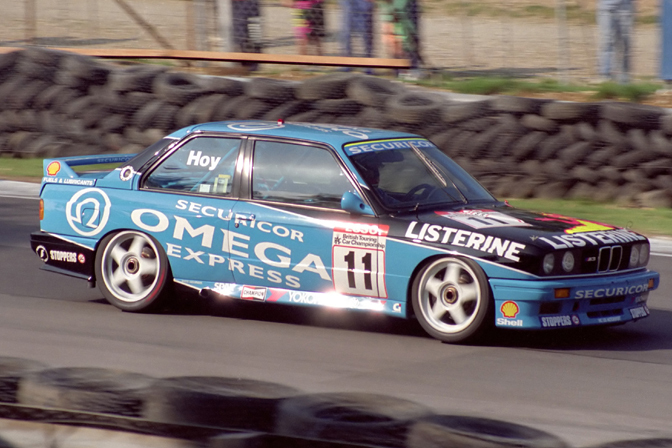 The Super Touring formula was born from a new 2-Litre class, introduced into the British Touring Car Championship for 1990. The name ‘Super Touring’ wasn’t used for a couple of years, when the regulations were adjusted and adopted by the FiA and used around the world. Previously, the series had multiple classes and often, a car in a smaller class would take the championship, even though, to the casual viewer it would be mid-field. In addition the main Class A was expensive and car development was spiraling out of control. 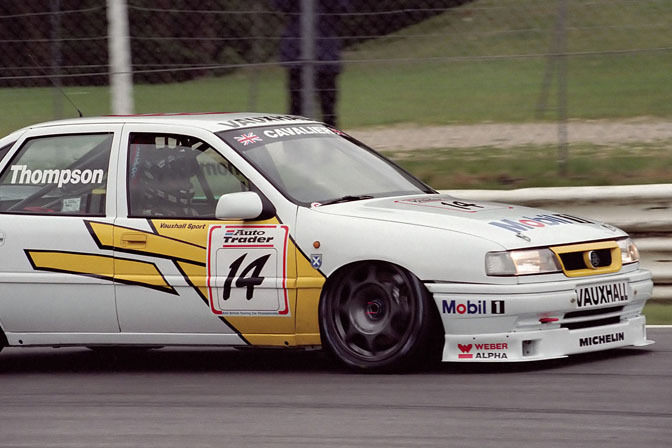 A Super touring car was required to be mid-sized vehicle, and later, have a minimum of 4 doors. Engine capacity was limited to 2-litres normally aspirated 4 cylinder or V6, although this engine could come from another car in the manufactures range. This allowed BMW to replace the standard M3 2.3 litre unit with the smaller 2 Litre. The racecar had to be based on a production car, with a minimum of 2500 units. This is quite a small number for the likes of Alfa Romeo and BMW, so this was increased to 25000 in 1995, to eliminate special homologation specials. Rear spoilers, and modified front bumpers and fenders were later allowed. 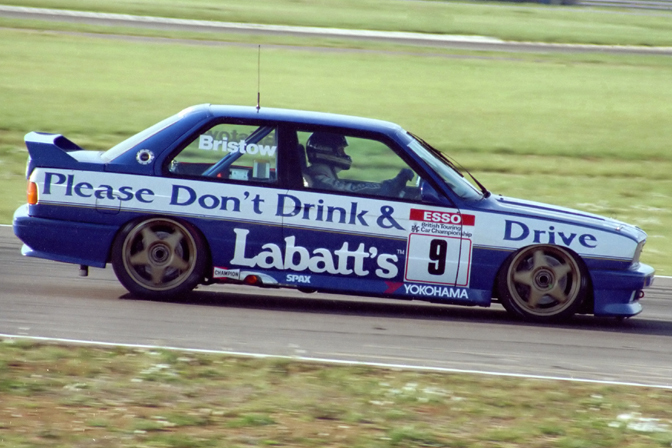 The new class ran in tandem with the Class A regulars like the Ford Sierra RS Cosworth for the 1990 BTCC season. The new 2 litre class championship boiled down to a 1 on 1 fight with BMW M3 driver Frank Sytner and Vauxhall’s John Cleland. The battled turned nasty with a couple of rounds to go when Sytner went for a gap that was never there and took himself and Cleland out. Cleland would take the final win of the season, but Sytner took the inaugural class championship. Rob Gravett in the Group A 500bhp Ford Sierra RS Cosworth won the overall championship. 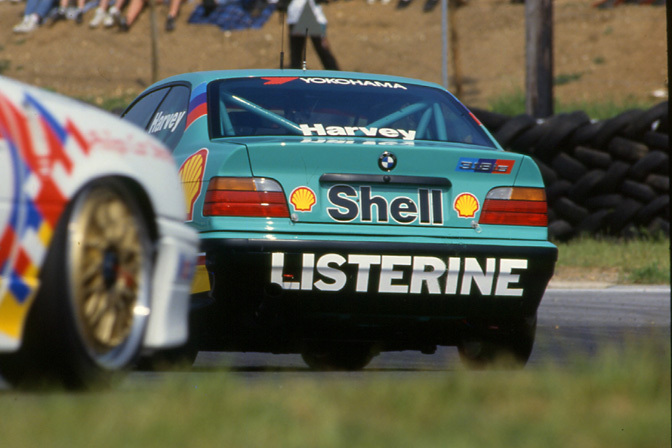 Group A was dropped for 1991, and the extra year of 2-litre racing gave BMW and Vauxhall an advantage. A wide variety of cars would be entered including a Sierra Sapphire (sedan) for champion Rob Gravett, a Mitsubishi Lancer, Nissan Primera, Rover 216 and Toyota Carina. At the front it was BMW v Vauxhall again. In the BMW corner, the Mobil sponsored works team, prepared by Prodrive, while the semi works cars of Vic Lee Motorsport (below) and Team Labatt’s cars (above) were also title contenders. Vauxhall concentrated their efforts on their two car works team. 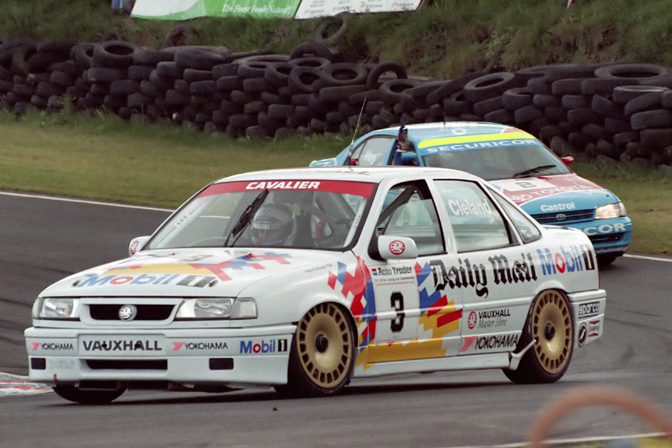 The championship came down to a battle with the late Will Hoy (above) and John Cleland (Vauxhall Cavalier). Hoy looked to have the championship sown up until retiring in the penultimate round. Hoy eventually took the title from John Cleland and Andy Rouse, in a Toyota Carina. 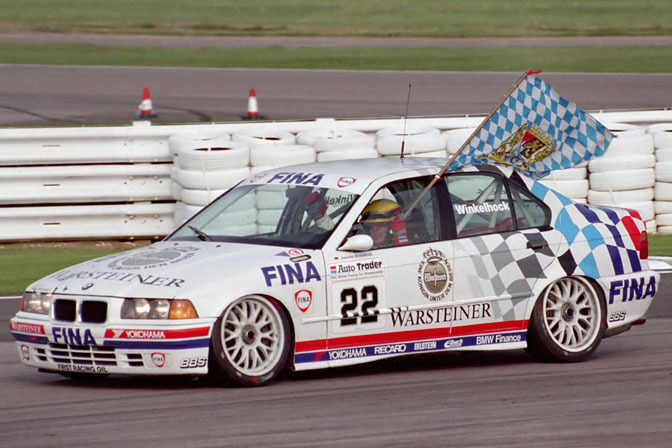 BMW introduced their new shape E36 318is model for the 1992 season. Prodrive ran cars for Tim Sugden, Alain Menu, and a one off drive for rally legend, Colin McRae. 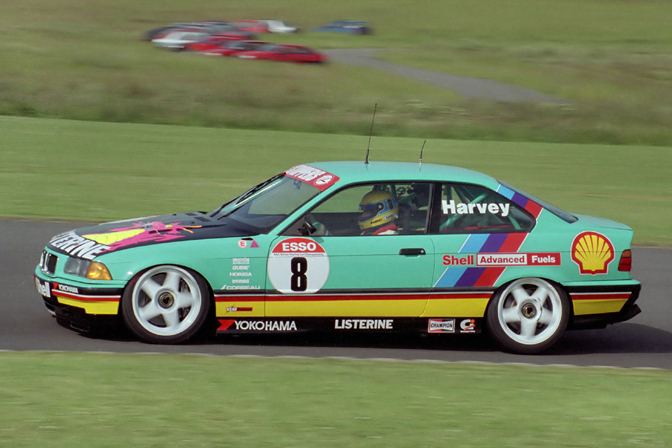 Meanwhile Vic Lee Racing ran a three car team, including current BTCC commentator, Tim Harvey. Peugeot and Mazda cars were also entered, while RML entered additional Vauxhall Cavaliers for David Leslie and Bobby Verdon-Roe. 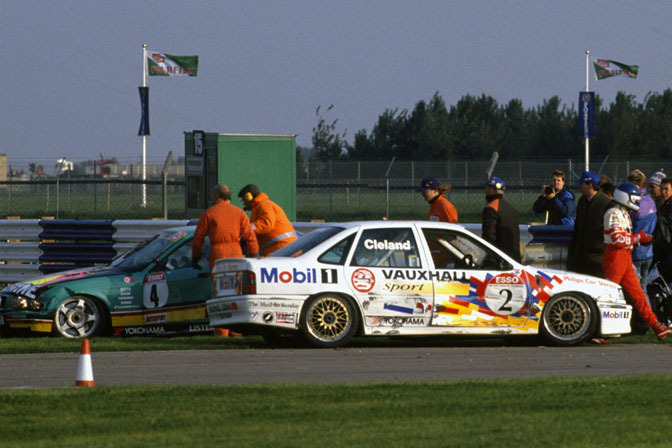 Vauxhall’s works driver John Cleland had the upper had, winning the first couple of rounds from multiple champion, Andy Rouse. Rouse and new teammate Will Hoy would take honours in the next two rounds in the Toyota Carina, before Cleland returned to the front. As the season progressed, the Vic Lee Motorsport team found a set up for their new cars and Tim Harvey would take six race wins, and the championship. It was a controversial title after Harvey’s team mate, Steve Soper had clashed with Championship challenger Cleland with a couple of laps to go. If you saw the recent Top Gear where they celebrated 50 years of the BTCC, you will have seen this. Shades of the previous year. Meanwhile Team owner Vic Lee was caught drug trafficking and sent to prison. The team was liquidated and its assets sold to new owners, VLM race driver Ray Bellm and Steve Neal. In years to come, this would morph into the Team Dynamics BTCC team we see today. James Kaye, who raced with Andy Barnes in the Britcar 24hours last year, took the new ‘Independents Cup’ in his Toyota Carina, beating off youngster, Matt Neal in a BMW M3. 1993 saw some changes with teams and cars and series sponsorship. Car Classifieds Magazine, Auto Trader took over series sponsorship and the prize fund was increased. ToCA now ran the series, having taken over from the national body. 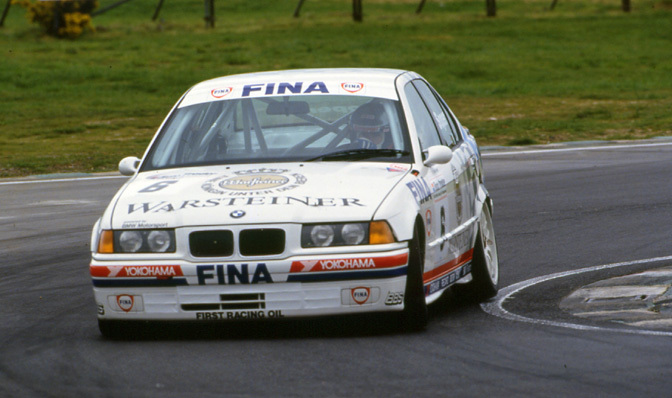 BMW GB withdrew their works supported team, but was replaced by Schnitzer Motorsport from Germany, running E36 3 series sedans. Meanwhile, new Team Dynamics team remained with the E36 318is and now had Matt Neal in the family run team. 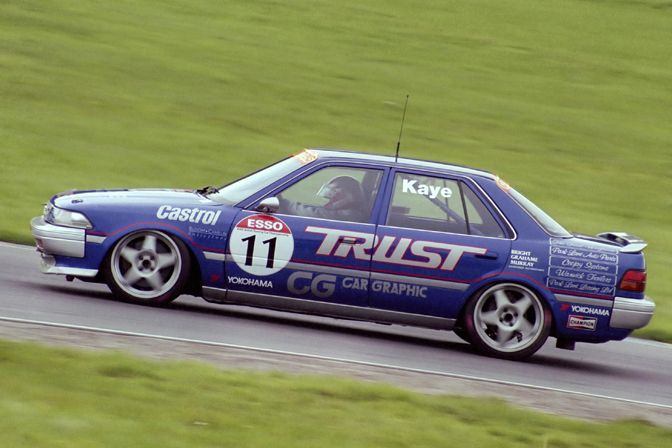 Toyota brought their Touring Car team in-house at TOM’S GB while their 1992 team, Rouse Engineering, signed a deal to build a new team around the Ford Mondeo. Renault also entered with their new Renault 19 saloon. 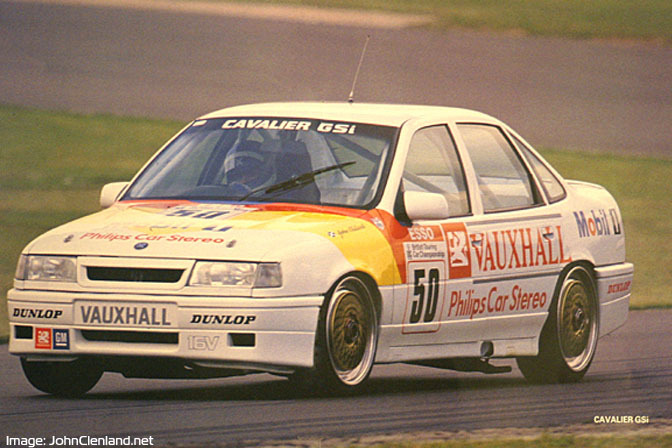 Ray Mallock Racing (RML) had developed their own Vauxhall Cavaliers in 1992 and in part, due to the talent’s of the late David Leslie, would occasionally outpac e the works Vauxhalls, including taking a win late in the season. Vauxhall noted this and RML ran the works cars two years later. BMW dominated in the first half of the season with multiple wins for the Schnizter run ream. Round 9 was the British Grand Prix support round and would see Nissan win with the late (great) Keith O’Dor. Keith’s father, Jan was well know for the Janspeed operation. 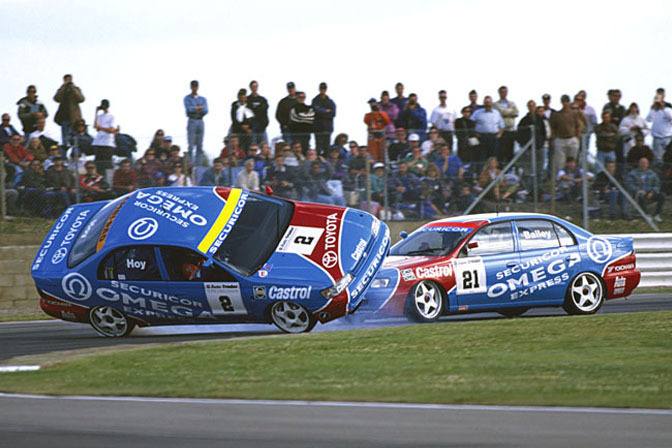 However, the race is remembered for the two Toyota drivers, Julian Bailey and Will Hoy colliding outside the BRDC stand. The image below made the front cover of Autosport Magazine, which was great for me, as that was my very first livery design! 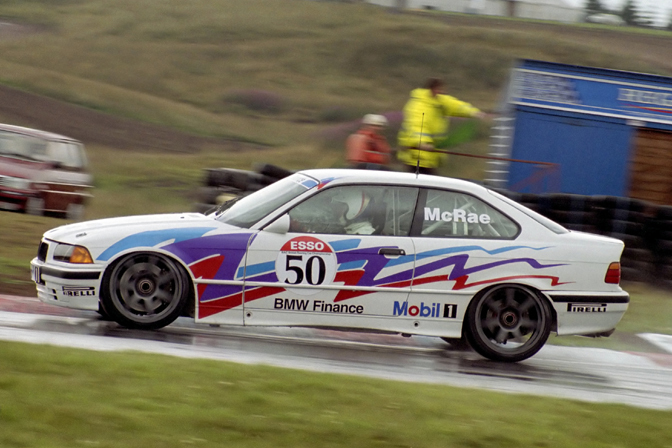 Bailey would save face a couple of races later, taking a win at Knockhill in Scotland, but the championship would end up in the hands of Schnitzer driver Joachim Winkelhock, with fellow BMW driver Steve Soper second. Super Touring was adopted by many national series around the world and at the end of 1993, the FiA organised a Touring Car World Cup. Paul Radisich in a Ford Mondeo won the event. He would repeat this feat the following year. The new style championship was now in full swing, thanks to increased television coverage on the BBC. Double-header rounds now made up the majority of the championship for 1994. 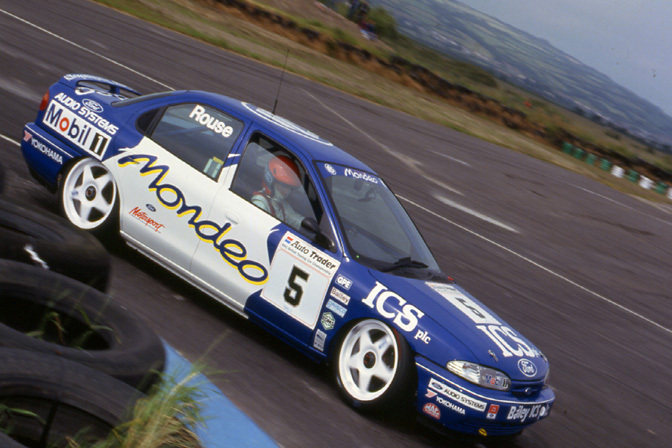 Ford and Rouse Engineering had developed their Mondeo into a potential race winning, while Vauxhall moved the running of their team over to RML, who run Chevrolet in today’s World Touring Car Championship. 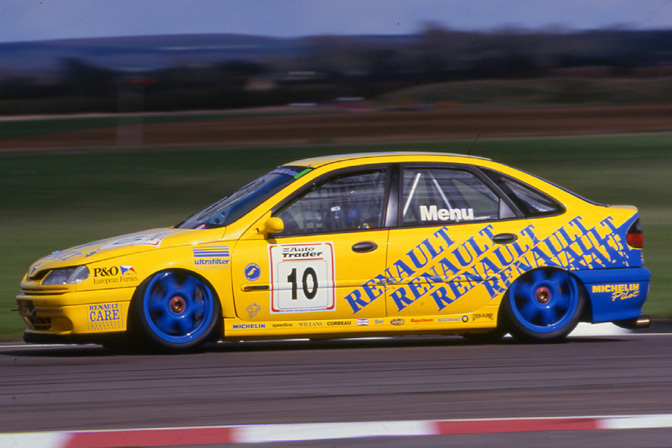 Renault ditched their 19, replacing them with the much improved Laguna, which would become the most successful Super Touring car in the BTCC. A division of the Williams Grand Prix Team would run these cars. Alfa Romeo and Volvo also joined the series. 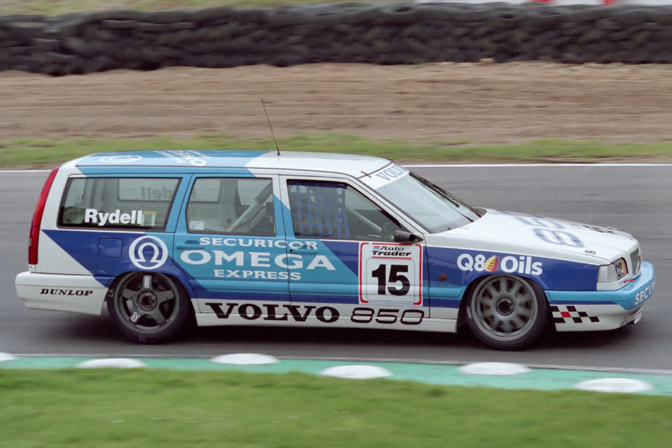 Volvo contracted Tom Walkinshaw’s TWR to run a 850 Estate/Wagon (!) for Jan Lammers and Rickard Rydell. 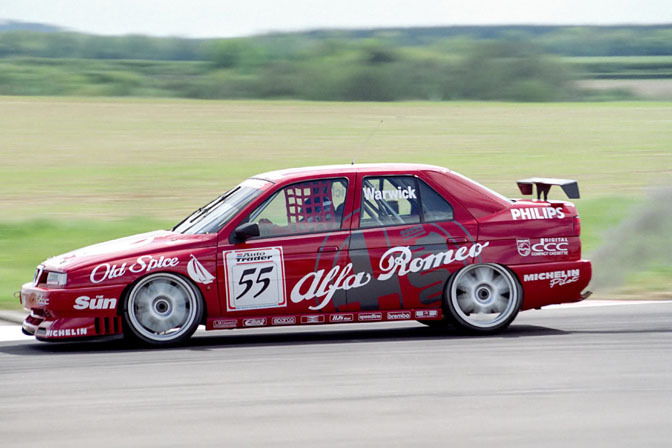 Alfa was more conventional with their 155 for ex Formula 1 driver, Gabriele Tarquini and Ginapiero Simoni. 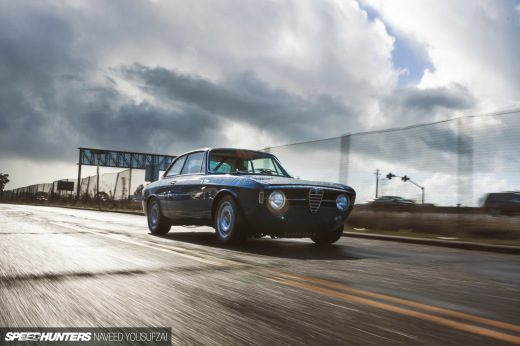 Alfa was immediately dominant, thanks to the Italian squad pushing the rules to the maximum. The Homologated cars came with splitter and rear wing spacers in the trunk, allowing the race team to include these on their racecar when required. The other teams were not happy and filed a protest, which ToCA agreed with. Alfa withdrew in disgust and were persuaded to come back later, without their spoiler ‘spacers’. Rules were changed to limit this from happening, but teams would be allowed to run aerodynamic aids the following year, including a rear wing mounted mounted on the trunk. Despite being very successful, this would start a spiralling cost increase, which would later see Super touring formula break up as the new millennium approached. The later half of the season saw Tarquini come under pressure from BMW, Renault and Ford, but Tarquini would take the title from Renault’s Alain Menu and Ford’s Paul Radisich. 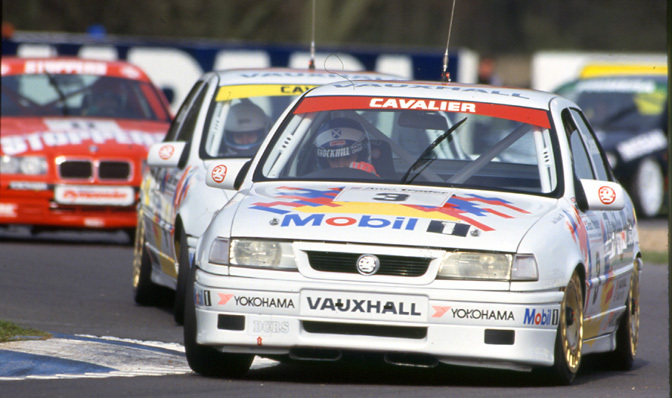 John Cleland in the RML Vauxhall would be fourth. 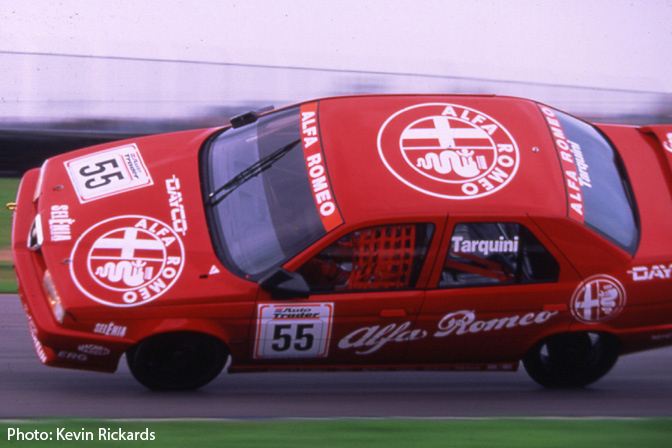 In 1995, Gabriele Tarquini was joined by ex-F1 driver, Derek Warwick at Alfa Romeo. You can see the new specification rear wing, front wing and fender flares on the above image. 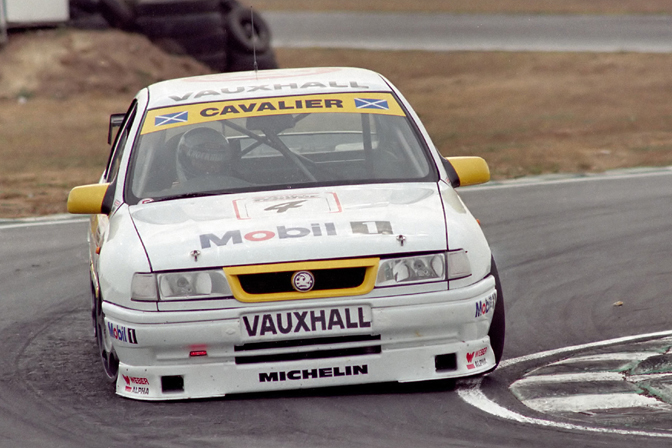 RML were the dominant team in 1995 with the Vauxhall Cavalier. 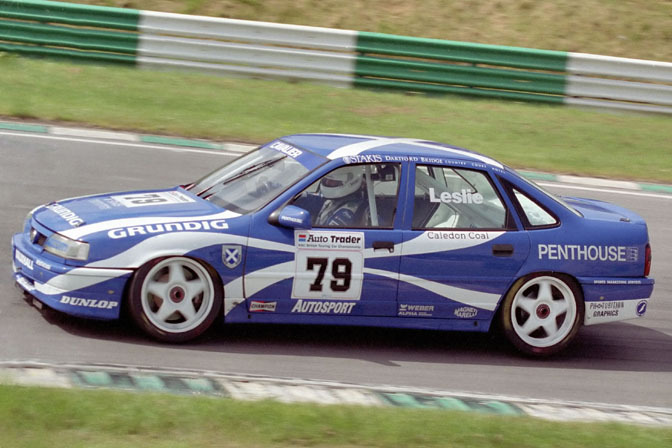 Lead driver John Cleland was joined by new-boy James Thompson who had shown great promise in a privateer Peugeot in 1994. BMW enlisted future ALMS star, David Brabham to help Johnny Cecotto. Note the new aerodynamics front bumper and rear wing, compared to the previous BMW images. 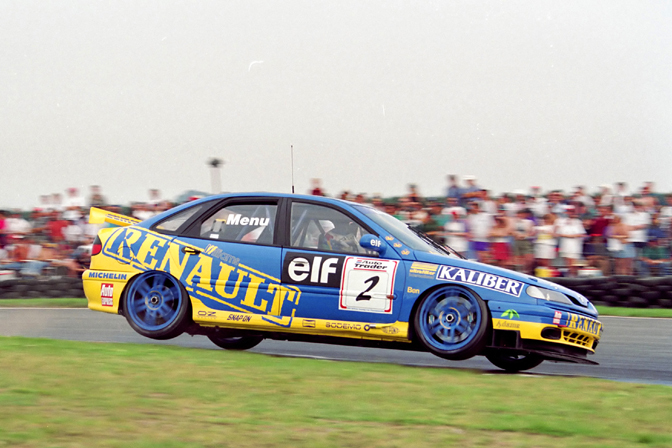 Cleland would take the title from Alain Menu in the Renault team, with Volvo’s Rickard Rydell in third. 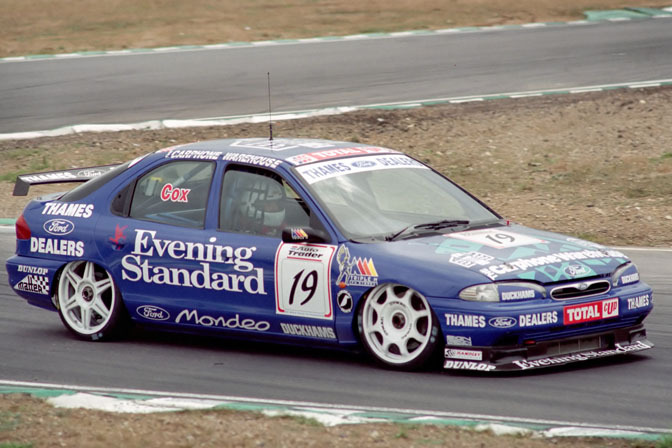 Top Gear Australia presenter Charlie Cox would race in a Independent Ford Mondeo, but it was Matt Neal who took the ‘TOTAL Independents Cup’ in a similar Team Dynamics Mondeo. 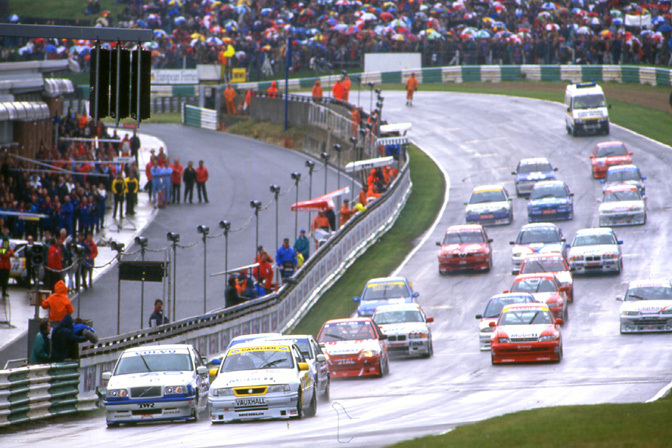 Half way through the decade, the British Touring Car Championship was a huge success. BMW, Vauxhall, Volvo, Alfa Romeo, Renault, Toyota, Peugeot and Ford all competing at the top level. 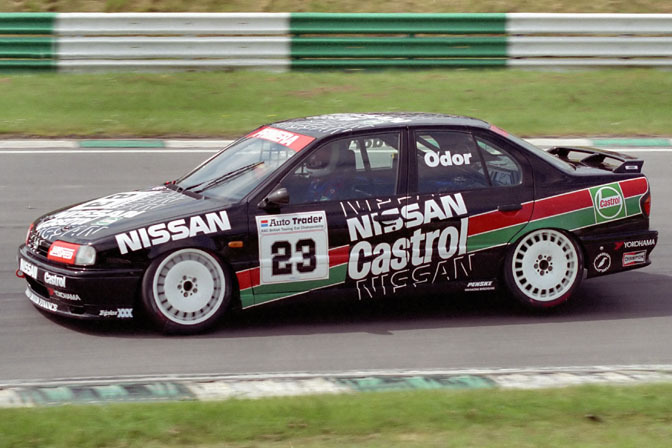 In part Two, we will look at the second half of the Super Touring era, the dominance by Audi, a championship for Nissan and the demise of Super Touring as we neared the millennium. "BMW introduced their new shape E46 318is model for the 1992 season"
Nice! I didn't know there was a Mitsu in the BTCC. Was this a Mitsubishi factory backed car or was it a Privateer group? 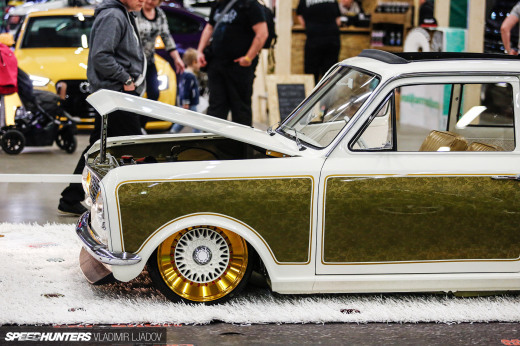 I did a quick image search on google but came up with nothing...you guys happen to have any pics of the car? Yeah they are E36's.. 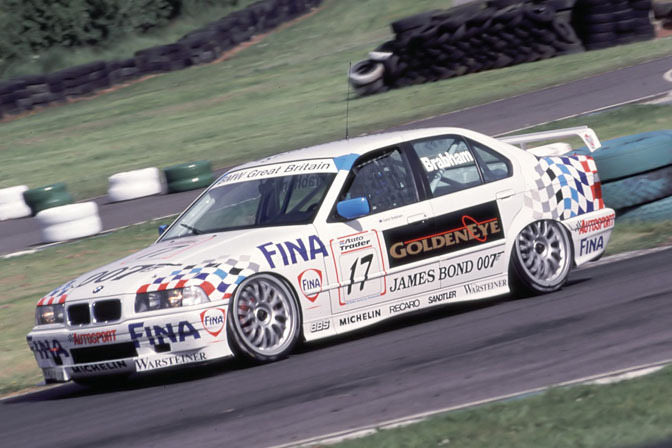 But still, this era of Touring Cars was the greatest, im glad to have watched them all as a kid! Amazing read, I grew up watching the BTCC as a kid and its pretty much why I love cars and tuning now. Yah! 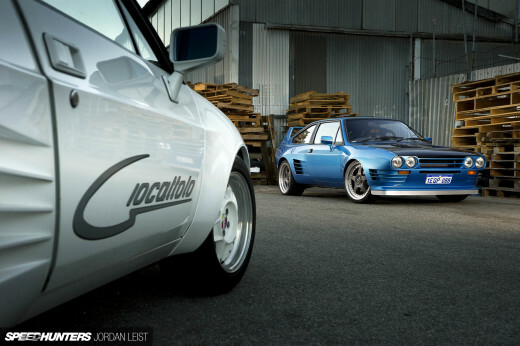 someone on speedhunter should feature the Sierra RS500 Cosworth! 2 litre engine, 2.5 bar of boost and 500ps! how many car had those numbers during those time man! As others have said, I grew up watching BTCC evolve. I used to look forward to the rounds at Pembrey, I have fond memories of sitting inside the marshalls post at Dibeni bend with my dad and handing him the flags as they were needed, this must've been 1992. Meeting Andy Rouse and getting a few autographs that weekend was what it was all about for a starstruck 11year old karter. 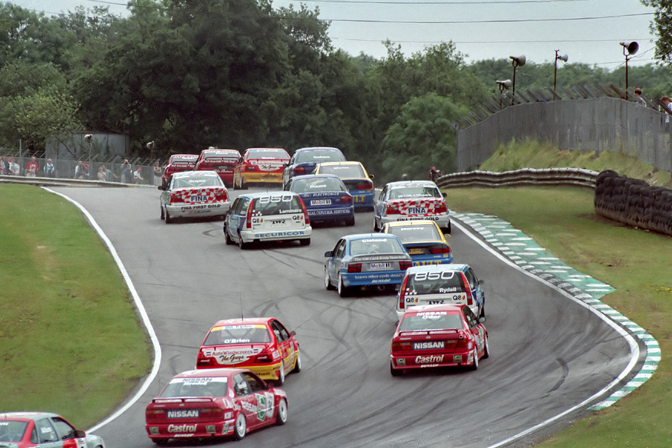 The late 80's to mid 90's were definitely far and away the best years of the BTCC. What it has become recently doesn't even compare. excellent article!! You and John Brookes always come up with great stuff! Andy: Thank you! That is so awesome! Funny though I remember seeing a illustration of that Group A starion...never thought about it until now. I have to admit I'm still pretty fresh with the whole touring scene...but it was the NATCC[you guys remember that short lived series? ]/JTCC that got me into tuning import cars and later found DTM, BTCC etc. Dayum, somebody please tell me theres more images of that blue/silver Carina II ! Andy Blackmore: great! yah i agree nice pictures of it are hard to come by... i will look around too! Thanks andy, nice to see that even my beater of a car has some racing-heritage. That was a brilliant write up Andy. Don't suppose you are in the UK in '09,.. I'll buy you a drink for that entry alone! I love the wheel fitment and stance of the old BTCC cars! 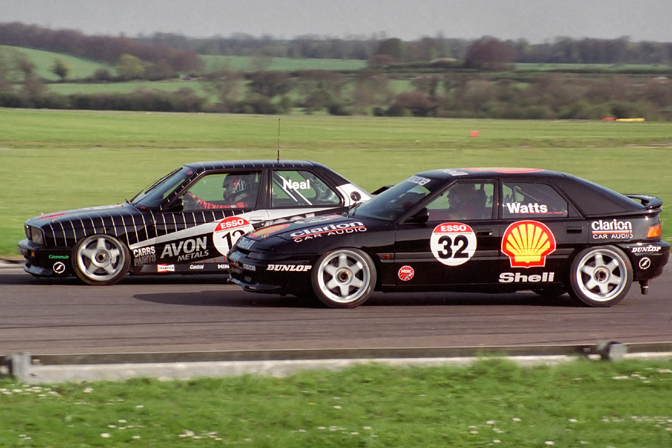 There is no mention of the Mazda Xedos 6 that Patrick Watts ran in 1993 and the two car team David Leslie and Matt Neil ran in 1994.